At an event, a fan approached George Lucas and politely asked him for the theatrical release of Star Wars on Blu-Ray. He rolled his eyes and snapped, "Grow up. These are my movies, not yours." They are his movies, but we have a right to enjoy them unaltered. They're our movies too. We paid for them. 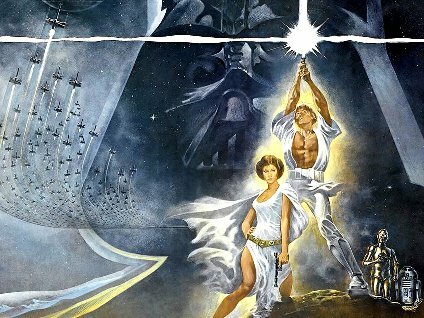 A few months ago, I posted some reasons Why We Should Have a Screening of the Original Star Wars. A lot of my research came from the awesome Star Wars fansite SaveStarWars.com. Since 2010, the site is dedicated to making "visible a disturbing and frustrating example of film history being re-written and suppressed." The creator of the site is Michael Kaminski, the author of the unofficial book The Secret History of Star Wars. I'm honored that Mr. Kaminski agreed to an exclusive interview with "The Geek Twins" to answer the question "Could we ever have a screening of the original Star Wars? The short answer is "yes," but it would take a long time and a lot of effort from you, the fans. Q: Thanks for agreeing to do this interview Michael. First, do you think there would be any interest in a public screening of the original Star Wars? Properly promoted, this would be an instant sell-out. No one has seen this in twenty years in anything but VHS and Laserdisc quality. As the poor reviews and bad box-office indicate, nobody wants to see Episode I in theatres again, even if it's in 3D-and yet the Blu-rays broke the record for units sold. I wonder what was driving those sales? It doesn't appear to be anything with Jar Jar in it. The original versions of Star Wars are about the only instance of a modern film that is "lost"- and it's arguably the most popular film ever made! The chance to see this on the big screen would attract classic film buffs and modern audiences alike, just as it did in 1997. In 1997, by the way, the original film earned about $120 million in about a month - equivalent to about $200 million today. Contrast that with the $45 million 3-D Episode I will have made. It's always been obvious that the original trilogy is what drives the entire Star Wars engine and no film is more sacred than the original. Q: Lucas has said that the negatives of Star Wars took an enormous amount of work to clean up. Are there any watchable film prints of the original Star Wars left? That depends on what your standards of "watchable" are. Many prints of Return of the Jedi look new, other than some light dirt and scratches, because they were printed on better film stock introduced starting in 1982 and so they aren't prone to fading (this does not apply to all prints, as I recently watched one that was basically red, and falling apart). Unfortunately, even if care is taken in storage prints of ANH [A New Hope] and ESB [The Empire Strikes Back] will inevitably have faded. As they are, many are watchable, but the colours will definitely be colour-shifted to pink to some degree, which is why "watchable" can be subjective. But, this is just watching prints "as-is." The original negative to Star Wars would hardly be considered watchable as-is because it too has damage and fading, which only goes away once it is colour-timed, either photochemically as in 1997, or digitally as in 2004/2011. Run through a telecine (a method of movie copying) to correct the fading, most prints would hold quite well. The one instance where none of this would apply is in the rare Technicolor IB prints of Star Wars, which don't fade and have great colour and detail. So, the only problem with those is any scratching or dirt that has accumulated. But these are very rare, and only a handful exist in the world. Q: I've heard stories of Lucasfilm confiscating film in private collections. What legal questions come up when talking about showing the film in public screenings? Lucasfilm has definitely confiscated prints and shut down screenings. The legal questions that come up is basically this: in almost every case you have to clear permission with Lucasfilm and Lucasfilm does not clear permission, period. They don't even clear permission to show the 1997 SE most the time, because Star Wars screenings are on moratorium except for select special events. You basically have to take the chance that Lucasfilm simply won't find out, and even then if it is publicized enough they may take legal action retroactively (I've never heard of this happening, but it certainly could). In 2010, a Technicolor print was screened, but only because Lucasfilm didn't know, and even then the theatre owner probably didn't care about legal repercussions because it was the theatre's last day of operation with that owner. Even having the screening be free of charge is a grey area. Technically, me inviting five friends over and showing them a movie violates copyright exhibition rules if you read the letter of the law, but it would be absurd to persecute people doing this because it would be considered fair use. But that's why a lot of schools are hesitant to screen movies on a television--they probably would have no problem (how would anyone know anyway?) but schools don't want to have to deal with any legal issue, even if they are in the clear. This atmosphere of fear is what keeps a lot of people from screening the films, even when they are in the clear, just because if Lucasfilm sends five high-priced lawyers after you, you still have to deal with that headache. It's what happened to the Library of Congress (LOC), according to an insider I know there. They were going to screen the original 1977 print of Star Wars on site, for free, as part of a historic festival, which they legally can do--they can screen any item they have as long as it is on site, but can't loan them out. The issue of permission came up, and they decided to ask Lucasfilm as a courtesy. Lucasfilm said permission was denied. The LOC could have screened it anyway, as they had every legal right, but they didn't because they didn't want to have to deal with any trouble Lucasfilm might give them. Sad, eh? Q: That is very sad. George Lucas has said that he wants all the original versions of the film to "disappear." In your opinion, what do you think it would take for Lucasfilm to release the original film in the theaters? This will sound morbid, but possibly it will take the death of George Lucas before this happens. The entire issue boils down to his own personal vendetta, and once he is out of the way, things will change. It is unclear what sort of policy will remain in place when he is gone, or what sort of control the company will have, but personally I feel that for the originals to be released it may have to come down to Lucas himself finally moving out of the way. I would like for him to do this voluntarily in his own lifetime, but at this point it's hard to say if he will. If he doesn't, someone in the company will get things going once he passes. And even if they don't, on a long enough time scale it is inevitable that all those print owners out there will do their own high-def transfers. But ideally, you would want them made from archival material like negatives, and Lucasfilm has a total monopoly on those elements right now. I do hope he comes around though, because I feel his reputation has taken enough self-inflicted beatings as it is. At some point the films will all be public domain, and then anyone can screen them in theatres, but not only will you and I be dead by that point, our children probably will be as well. By that point, it will be a niche audience of classic cinema buffs who will be the only people watching them, like silent movie fans today. So, don't hold your breath on public domain. We need to get these films looked after and available today, and I really do think the thing that will make this happen sooner rather than later is if there is public pressure and protest. That's part of the whole drive on the part of my site to make this issue visible and show the world that people care. Lucas thought everyone would jump on his side and embrace the Special Editions but the monster that he created that allowed him to become a billionaire and make those SE was so big that he couldn't control it, he never stopped to consider how meaningful the films are to society and to individuals. I think as long as we keep reminding people of this, we are on the right track. Q: Hopefully, in some small way, we can help get the word out there. On a personal note, when did you develop your passion for Star Wars? I'd say about two years old, maybe three. My dad showed me it on VHS and I loved it and watched them all to death, and then later on in the mid-90s the films came back to popularity and it really cemented mine (and many other people's) love of the films. A lot of my interest in filmmaking and film history stems from my interest in Star Wars, as is the case for many other people. Thanks Michael! So, there you have it. If you ever want to watch the original Star Wars on the big screen, the way it was meant to be, it's up to you. But, you may be asking "what can I do?" The website SaveStarWars.com answers the question. Write to Lucasfilm and let them know that people will not accept such disregard for such important films. Link to us, post about the issue, get people talking and don't let it die. There are media contacts listed in the resources section. Read our resources and editorials and inform yourself of exactly what has happened. New readers or those with specific questions in mind might want to browse the FAQ to start. Want to know How the Grinch Stole Star Wars? Make sure you visit savestarwars.com or secrethistoryofstarwars.com today to learn more! What do you think? Do you still love the original trilogy? Do you think the original films are worth preserving? Sad Lucas might have to die for the originals to be seen again, but it's probably true. I think success, money, and fame have brought him to a place where he doesn't feel anyone can ever tell him no. Absolutely they should be seen again! I won't hold my breath, I'll hold onto hope instead. Great blog. I've linked you guys at mine over at notsodaily.com. Hopefully, it won't come to that Alex. I would definitely hold onto your videotape though. With the 2006 DVD out of print there's no other way to get the original film. I wonder why George Lucas doesn't want a star on the Hollywood Walk of Fame? Its a strange one but its true. Daniel, I agree. Thanks for the link man. "Star Trek," as "The A-Team"